We have seen vast amounts of verbalized hyperbole sufficient to express the dramatic effect that BP (British Petroleum) has and will continue to have on U.S. marine wild life. The magnitude of damage to our seafood industry equals the environmental catastrophe now labeled “Deepwater Horizon.” That area produces one-fifth of America’s annual seafood. The loss will be short of the Armageddon of Oil but not by much. So we’re faced with an oil slick the size of New Jersey able to blow out 50,000 barrels a day (2,000,000 gallons) in a heartbeat, according to a “not for public” NOAA emergency report. This underwater oil geyser monster is spewing upwards of 100,000 pounds per square inch of pressure, enough pressure force that if you had it you could lift 50 tons with your index finger. 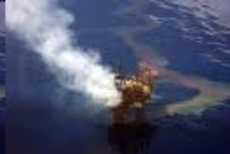 Obama wants to foist responsibility for the cataclysmic mess on BP but why. Yes, part of it goes there, BP did cut some corners. Still Obama, who banned such off shore drilling along most of the entire West Coast protecting California for certain and East Coast from Delaware on, left the Gulf at risk. Therein lies the mystery. Why would our top government official do such a thing? To protect his poetical election cash is the answer. Question answered. And why are our news media going along with hiding truths from us? Obama’s Wall Street pals are covering for that company we’ve all come to know and loathe – Halliburton. BP hired Halliburton to cement cap the gusher. For those unfamiliar with oil wells, once oil flows it requires a platform from which a cement cap can be placed to support the pump. Halliburton was in charge of the platform, undertaking the process that brought on the first explosion killing 11 men. Halliburton issues mountains of election dollars to nearly every politician in office today. In return, they get government contracts totaling many billions of dollars they hide from the public. When we watch oil swishing through our ocean waters in the wake of Coast Guard boats, folks, in far too many ways we’re seeing – our Government At Work.